South Africa 3-252 (Alviro Petersen 103*, Hashim Amla 66, Jacques Kallis 60, James Franklin 1-23) leads New Zealand 45 (Kane Williamson 13, Daniel Flynn 8, Vernon Philander 5-7) by 207 runs. Vernon Philander delivered a deadly spell of fast bowling in the opening Test vs. New Zealand as the visitors were crushed to 45 all out in their first innings. The Black Caps were humiliated for 45 in the first innings that was their third lowest Test score after 42 and 26 runs recorded earlier by them in the history books of Test cricket. 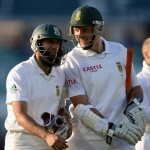 The Proteas responded by plundering 252 runs for the loss of just three wickets at the end of the first day’s play. 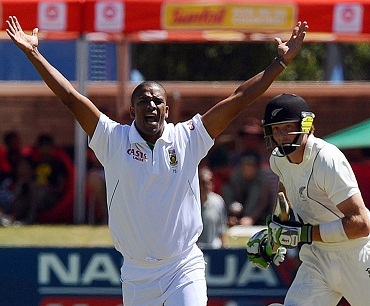 The first Test commenced on Wednesday, December 2, 2013, at Newlands, Cape Town. Earlier, the captain of New Zealand, Brendon McCullum, won the toss and elected to bat as Dale Steyn gave away one run in the first over. 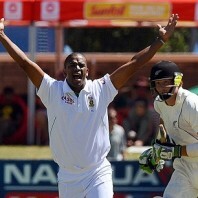 Vernon Philander took the ball from the other end and removed Martin Guptill for one run on the last ball of his over. Philander struck again in the sixth over when he got rid of Brendon McCullum and Dean Brownlie as the visitors were in extreme trouble at 3-14. Philander continued with his onslaught by playing with the records of the next two batsmen Kane Williamson and BJ Watling in his following two overs. Morne Morkel and Dale Steyn joined the show with their destructive bowling and the entire Black Caps were bowled out for 45 mere runs in 19.2 overs. Vernon Philander was the wrecker in chief and grabbed his career best figures of 5-7 runs, Morne Morkel held three whereas Dale Steyn got two wickets. South Africa lost their first wicket in the second over as well when their skipper, Graeme Smith was declared leg before wicket off Doug Bracewell for just one run. The brilliant Hashim Amla joined in with Alviro Petersen who made his intentions clear by hitting 2 back to back fours in the third over. Amla was going ahead of Petersen by dispatching 3 fours in the sixth over and preferred to score with the assistance of continuous boundaries. He attained his 24th Test fifty in the 17th over on just 55 balls comprising 8 fours. Petersen kept on consolidating from the other end and the first hundred of the innings appeared on board in the 22nd over. 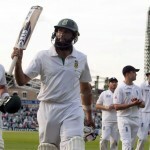 The second wicket fell at 108 as Hashim Amla was held lbw off James Franklin for 66 off 74 deliveries with 9 fours. The experienced Jacques Kallis took guards at the wicket as Alviro Petersen reached his fifty in the 30th over with a four. Kallis hit the first six of the innings in the next over and Petersen got the same result four overs later. The duo preferred to play aggressive cricket and the ball was sent out of the rope at regular intervals. Jacques Kallis achieved his 57th Test half century in the 45th over and the score crossed the 200 runs mark after two overs. Petersen was solid as rock at his end and the pair enhanced the score to 212 in 51.3 overs. Kallis was caught behind by BJ Watling off Trent Boult for 60 scored from 89 balls with 2 grand sixes and 5 fours. AB de Villiers walked in next as Alviro Petersen became the first batsman to thrash a Test hundred in 2013 while getting two runs on the second ball of the 63rd over. Petersen remained unbeaten on 103 off 172 deliveries with 1 six and 11 fours and AB de Villiers secured his end with 19 runs as the hosts piled up 252 runs with seven wickets in hand after availing 64 overs. South Africa has gained a commanding first innings lead of 207 runs with plenty of wickets still in hand. The prospects look bleak for New Zealand and they are in sight of losing another Test.